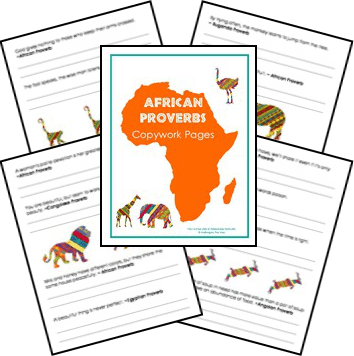 Today I have some more FREE copywork pages for you–a set of African proverbs. Lots of wise words for discussion here, so be sure and engage your child in conversation as she completes this set. Just click on the image below to snag the pages. If you are considering a unit on Africa (or on a specific country in Africa), try Homeschool Share. Lots of unit studies and lapbooks (for FREE). You’ll find resources for the following places: Kenya, Tanzania, Malawi, Egypt, Uganda, Nigeria, Ethiopia, Botswana, Ghana, and Morocco. 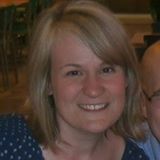 Looking for more FREE Copywork? 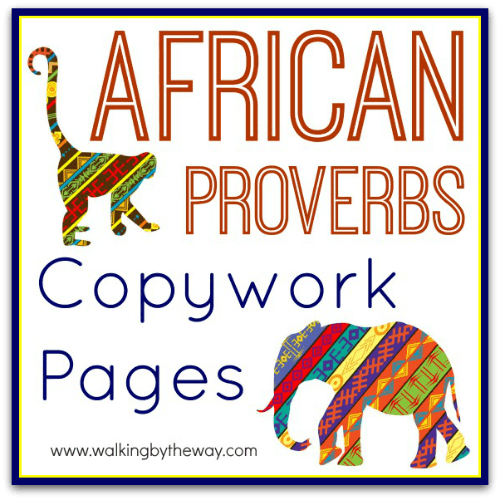 Check out my FREE Copywork Pages Pinterest Board!